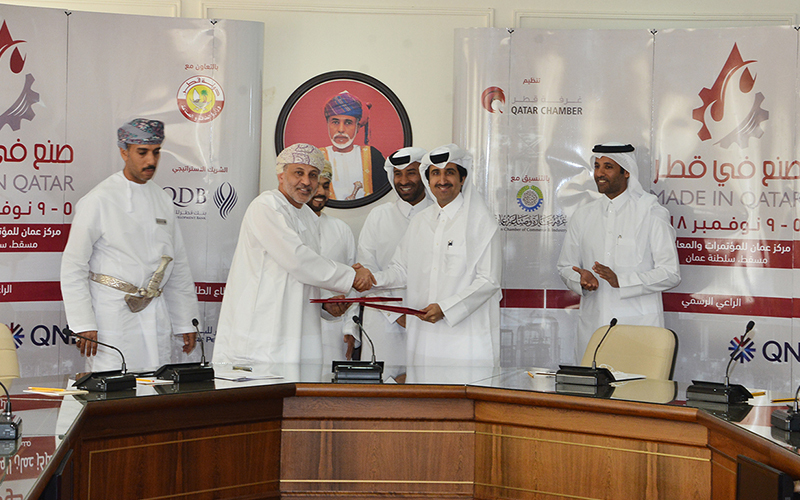 Qatar Chamber and Oman Chamber of Commerce and Industry (OCCI) have agreed to jointly cooperate and coordinate in organizing the “Made in Qatar 2018” exhibition, which will be held in the Omani capital, Muscat, next November. 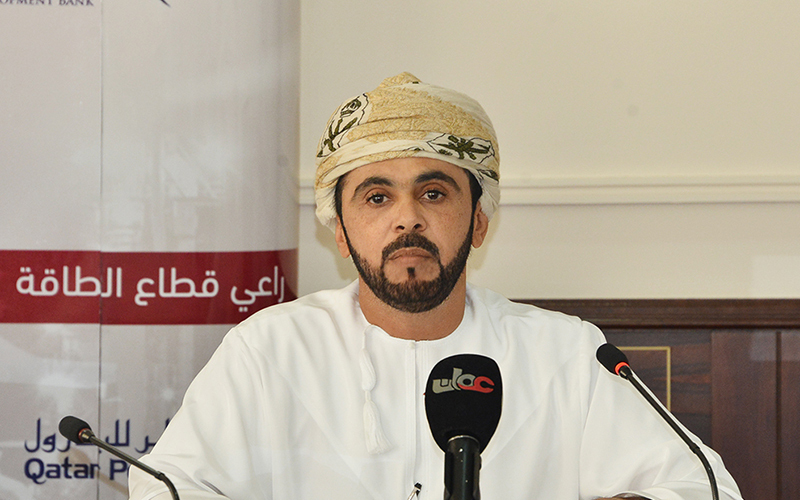 This came at a press conference held in Muscat, where the two chambers signed on its margins a cooperation protocol to activate the Joint Business Council. 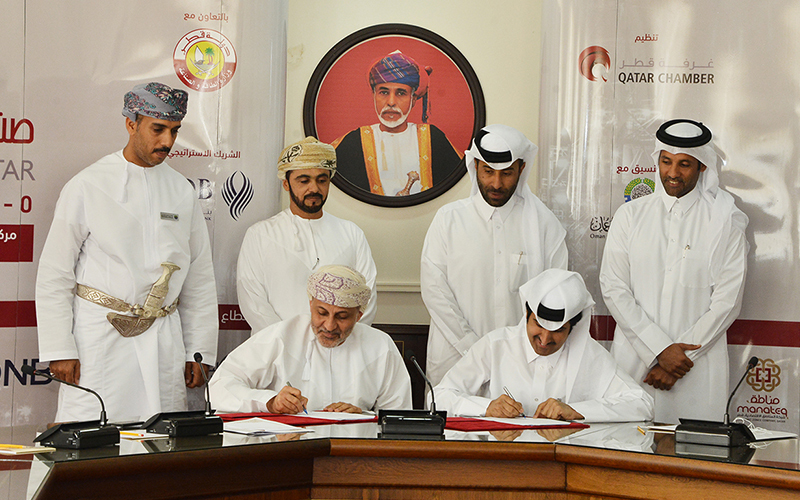 It was signed by Qatar Chamber Director General Saleh bin Hamad Al Sharqi and OCCI Director General Abdul Adheem Al Bahrani. OCCI Deputy Chairman Salem Al Junaibi praised the significant development of the relationship between the two sides during the recent period, including various economic fields in order to enhance the joint ties between the two brotherly countries and in line with the directives of the leadership of both countries as well. Al Junaibi added that the development of relations is evident in the high volume of trade as well as the growth of joint investments, where the number of companies in Oman in which Qatari capital is contributing has reached 152 companies with a total capital of about OR 116 million, of which OM 77 million are for Qatari companies, representing 65%. Al Junaibi further added that the Omani private sector values cooperation and partnership between the Sultanate and Qatar, especially in the investment and economic sector. He looked forward to achieving more at this level in view of the unlimited support for the private sector by leaderships and the governments of the two brotherly countries, calling on the private sector of the two countries to intensify mutual partnership in the priority sectors of the two states. Qatar Chamber Director General Al Sharqi stated that the cooperation between the private sector in the two countries will continue to be an excellent model and example, adding that the selection of the Sultanate of Oman to be the first venue of “Made in Qatar 2018” exhibition after the siege is an expression of Qatari political leadership’s appreciation for the privileged position that the Sultanate of Oman occupies in the hearts of Qataris. Al Sharqi further pointed out that launching the exhibition in Oman reflects the sincere desire of the Qatari businessmen community to shift the economic relations between the two sides from a level of fraternal and distinguished relations to the level of and strategic economic relations and partnerships, which translates those fraternal sentiments to huge projects and mega economic entities that benefit the national economy in both countries and add value to them. 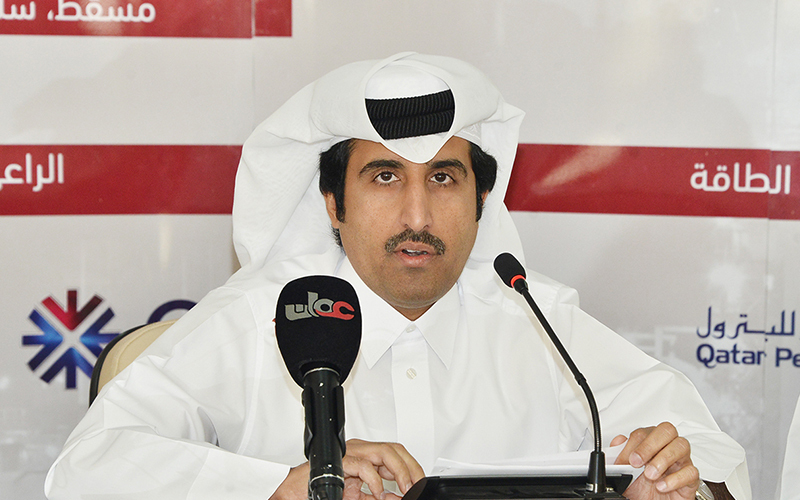 Qatar Chamber Director General said that organizing the exhibition, in which around 200 Qatari companies will take part, is a message to all those who though that the unjust siege will undermine the continuity of Qatar in its economic progress, and at the same time confirms that the State of Qatar is strong under its political leadership and its people and its businessmen. Al Sharqi noted that the organization of the exhibition in the Sultanate represents an important opportunity to introduce the Qatari industries and their technical progress and development, and their distinctive application of international standards that enabled them to compete with many imported industries, stressing that the Qatari-Omani business forum, which will be held on the sidelines of the expo, will be an opportunity for both sides to discuss mechanisms and ways to develop and strengthen relations, and to remove all obstacles and barriers that prevent the flow of goods and investments between the two countries easily and smoothly. Board Member of Qatar Chamber and Chairman of Made in Qatar Rashid bin Nasser Al Kaabi said that the exhibition, which will be held in Muscat in November, reflects the strength of the relations between the two sides and will take trade and economic cooperation between the two countries to wider and more expansive levels. 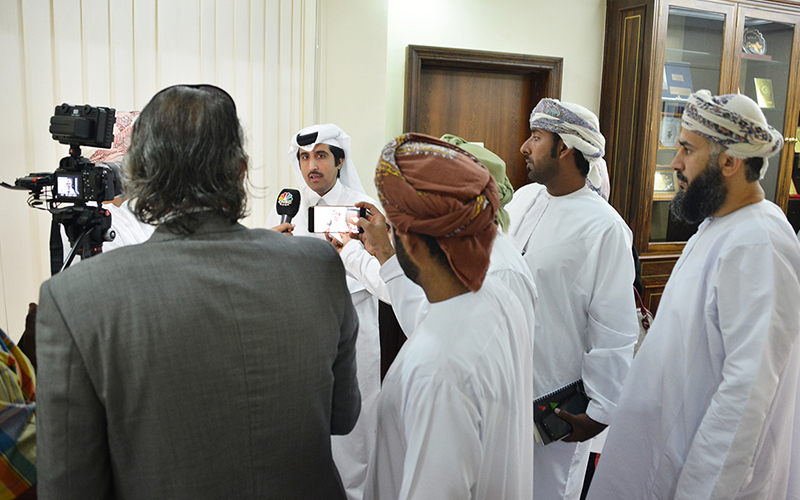 During the press conference, Al Kaabi pointed out that the economic cooperation between Qatar and Oman has witnessed a remarkable development in the recent period, especially in the sectors of agriculture, livestock, transportation, communications, energy, tourism, education, construction and banking services, in addition to a number of joint projects in the fields of agriculture, with a total of about QR 2 billion, pointing out that there are about 186 companies with 100 percent Omani capital operating in the Qatari market, along with 146 Omani Qatari joint companies. Al Kaabi pointed to the increase in trade between the State of Qatar and the Sultanate of Oman, which reached QR 3.5 billion in 2017 compared to QR 1.9 billion in 2016, achieving a record growth rate of 84 percent. He pointed out that the most important Qatari imports from Oman include live and slaughtered animals and fresh fish and frozen products, other food products, dairy products, prefabricated buildings and construction tools, as well as liquid filtration and purification systems, cosmetics and hair care. Al Kaabi added that the most important Qatari exports to the Sultanate of Oman included chemical nitrogen fertilizers, ethylene polymers in their primary forms, industrial gases and other hydrocarbons, as well as iron and steel, asphalt articles and similar materials, glass fibers and their products. He stressed the importance of the exhibition in achieving cooperation in the field of industry, pointing out to the increase in the number of factories in Qatar during the siege year by 17 percent, which is considered as a big motivation to allow the new factories to learn about the latest developments and technologies in the field of manufacturing in Oman, and to exchange experiences with the Omani side in this field. The “Made in Qatar” Exhibition is inspired by the vision of the wise leadership and in pursuance of the Qatar National Vision 2030 which focuses on income diversification. The main purpose of the exhibition is to support and promote the Qatari products in the pursuit of achieving the self-sufficiency and reducing dependence on imported items. The exhibition, which is held for second time outside Qatar after its first edition was held in Saudi Arabia in 2016, is supported by a bevy of leading industrial companies and factories, banks and institutions supporting industry in the country. The expo, which its first edition was held in 2009, represents a good opportunity for both countries’ companies to explore means of enhancing cooperation. It is a platform for businessmen to discuss the investment opportunities galore at all sectors and establish trade alliances that benefit both economies. It represents a major industrial platform that brings together local companies and factories under one umbrella. It also offers a brilliant opportunity for manufacturers, businessmen and investors to discover the locally-manufactured products, their strengthens and demands of the Qatari market. The exhibition also aims to provide the opportunity for exhibitors and producers to meet and discuss the possibilities of establishing partnerships and alliances that contribute to promoting the Qatar industry.